GM - FN was originally reported as a pocket pivot back on March 1st, and it has steadily moved higher since then. 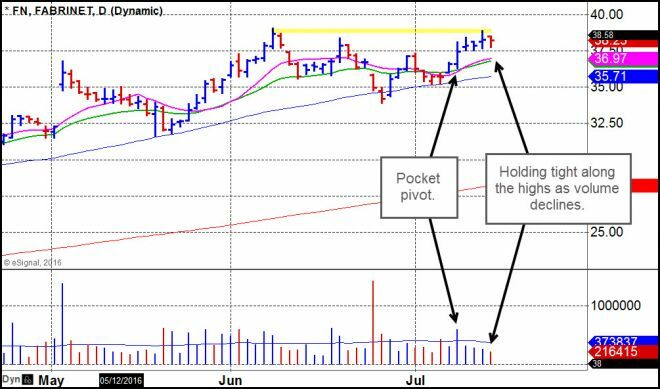 This past Monday's pocket pivot is a nice show of strength, but my preference would have been to have the stock on my watch list and then look to buy it on the low-volume pullback into the 50-day moving average seven and eight days ago on the chart. Here it is extended and I would prefer to remain opportunistic, seeking to buy any pullback into or towards the 10-day or 20-day moving averages, which are the nearest moving averages below the stock's current closing price. Dr. K - The more days FN holds tightly constructive in price/volume, the greater the odds of a successful move higher. Buying on constructive weakness back to its 10-day line would be an optimal place. FN has had two gaps higher on its last two earnings reports, and has managed to overall buck any market correction as it has managed to move to new highs a number of times. GM - ULTA has been on our pocket pivot and buyable gap-up watch lists for some time now as it has been in a steady uptrend for most of 2016. Here the stock is flashing a pocket pivot from a point just above the 10-day line on a gap-up open on Thursday. My preference would be to try and buy any pullback to the 10-day line. 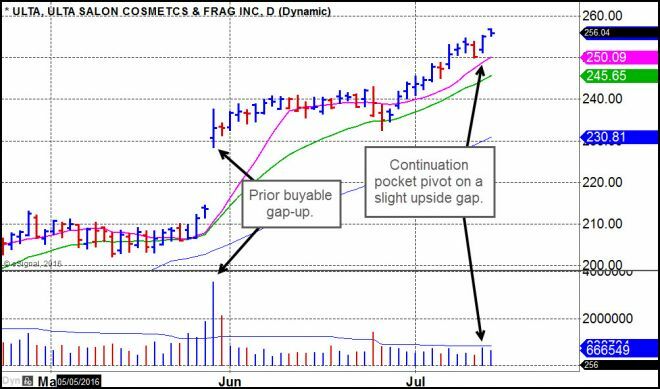 Dr. K - ULTA has gapped higher on each strong earnings report three times in a row. It has managed to move constructively sideways to slightly higher after gapping higher on its last two earnings reports. This all points to a healthy chart, but buying on constructive weakness back to its 10-day line is still prudent. Below is our current Focus List derived from pocket pivot and buyable gap-up reports sent out since March 2016. In some cases these names are in recovery mode as they come up the right sides of potential new bases, such as AMWD and MLNX, for example. Others are pulling back slightly after posting base breakouts, such as AYI, BSX, DY, EXP, FIVE, ISRG, etc. We would also keep a close eye on those currently setting up within bases such as EDU or UBNT, for example. EDU is actually in a low risk position to be bought as it had a pocket pivot on Friday off its 50-day line while still showing strong fundamentals. The sell stop could be placed just below its Friday intraday low.